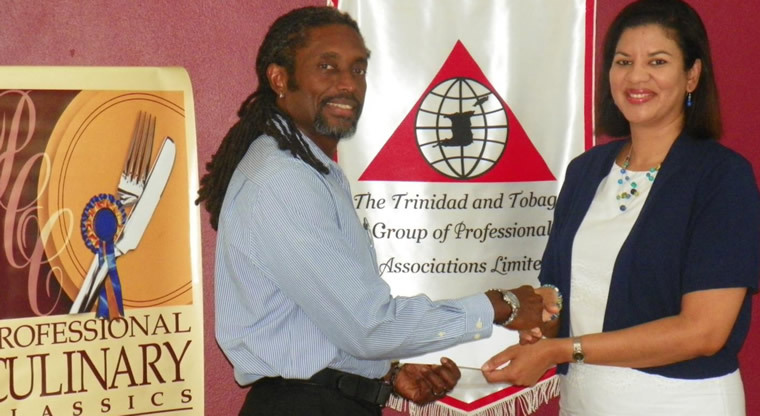 Founder and President of the Down Syndrome Family Network, Fitzherbert Glen Niles, receives a Donation Cheque from Vice President of the Trinidad and Tobago Group of Professional Associations Limited, Mrs Camille Cumberbatch-Dhoray at The Professional Centre in Woodbrook. The Down Syndrome Family Network was the ‘charity of choice’ for TTGPA’s 5<sup>th</sup> Annual Professional Culinary Classics – Champions Towards a Cause. The Annual Professional Culinary classics debuted in 2009, with the aim of bringing Professional Associations and Organizations in Trinidad and Tobago together in a competitive yet friendly environment, for capturing culinary bragging rights. TTGPA as a Non-Governmental Organisation, uses this opportunity every year to partner with a charity in need, by raising funds for their cause. The DSFN is known for doing great work in providing a network in which parents of caregivers of persons with Down Syndrome are able to access the resources, support and answers they need to educate and develop the full potential of these individuals throughout their lives.